Want to find a wild horse herd near you? 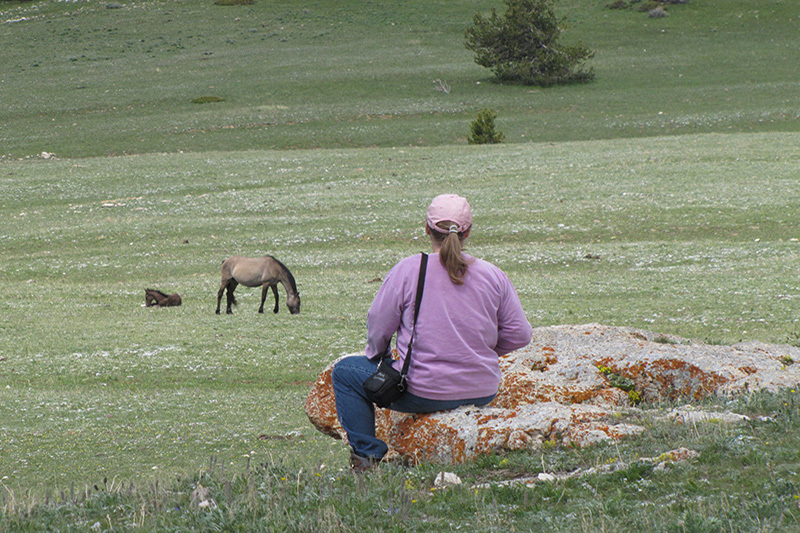 How do you interact with wild horses? You don’t. Keep your distance and be respectful of their space. You’re in their home, after all. Speak in a low voice if you’re talking to other people. Try to be as benign as possible. If they're paying a lot of attention to you, you are too close and need to move farther away. In general, if you are impacting an animal’s behavior, you are too close. In the Pryors, the distance to be able to watch horses behaving naturally is usually around 100 feet. It may be much farther in other herds. How do you get good photos if you are far away? Get a longer lens. Then, be patient. Hang out near a place that is visited by the horses, like a waterhole or a well-used trail. If a foal approaches you, pick up a couple small rocks and aim for their feet or legs. Don’t hurl the rocks, just gently toss them. Keep the foal away and let them know you are not one bit interesting! We hope this goes without saying, but: no one should ever attempt to feed wild horses or burros. They are wild animals. On hot days, wild horses – like most animals – are not very active during the heat of the day, unless they’re on their way to water. If you’re looking to see a lot of activity, we recommend early in the day or late in the afternoon. That’s the best light to take pictures anyway! Being in a small group of people can help in some areas. Large groups of people can scare horses away quickly. Pack for varying weather! Layers are your best friends, even in the summer months. Bring binoculars and/or a spotting scope, if you have one. Do not park your vehicle at a waterhole, even if there is a road down to it. Park away from it and then walk down. A vehicle can stop horses from coming to water. Stay on the road with your vehicle. Off-roading sets a bad example for everyone around you. Plus, off-roading causes a lot of damage to vegetation.